Please find our Medium Term Plan and Topic Booklet for Acorn Class for the Summer Term. Our topic is: 'Our Wonderful World' and we look forward to some exciting learning opportunities in both our indoor and outdoor classroom. Please note that all planning is subject to change depending on the children and their interests. Please find Acorn Class' Topic Booklet and Medium Term Plan below. We have some wonderful things planned including some animal visits. Please note that all plans are subject to change depending on the children's interests. We look forward to a fun and exciting term. 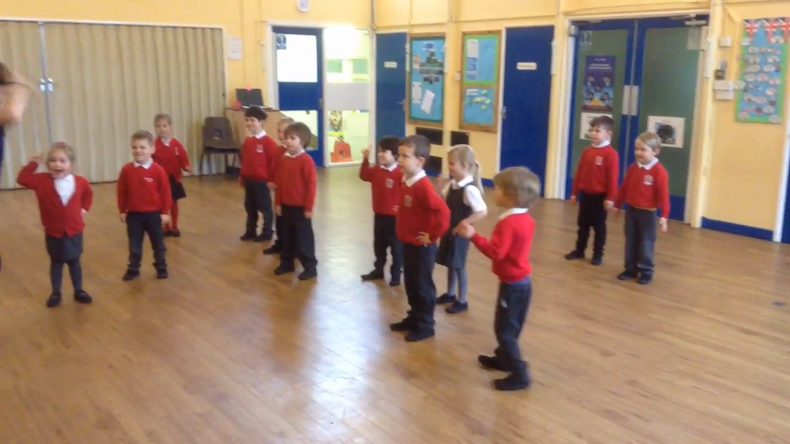 We were very proud to share our song and Learning Journeys with our family during our 'Mother's Day Open Morning.' We then decorated plates, pebbles and biscuits during our time together. Gardening in the sunshine, learning about soil, roots and growth. Thank you Star! Hissing cockroaches, tarantulas, pythons, an armadillo and a tegu named Diego visited today. An enormous thank you to the PTA for supporting this visit as we got to touch, hold and learn about the creatures. Our questions were incredible! We have been innovating our story and sharing it with our friends. All you need is team work! Happy World Book Day everyone! Don't we look amazing! A little bit of story making. Doubling in lots of different ways. Pancake races Upton Noble style! We explored real fish to help us understand how they use gills to breathe underwater. We then used pastels to draw what we saw! Can you make a sledge that will take you and your belongings to the South Pole? 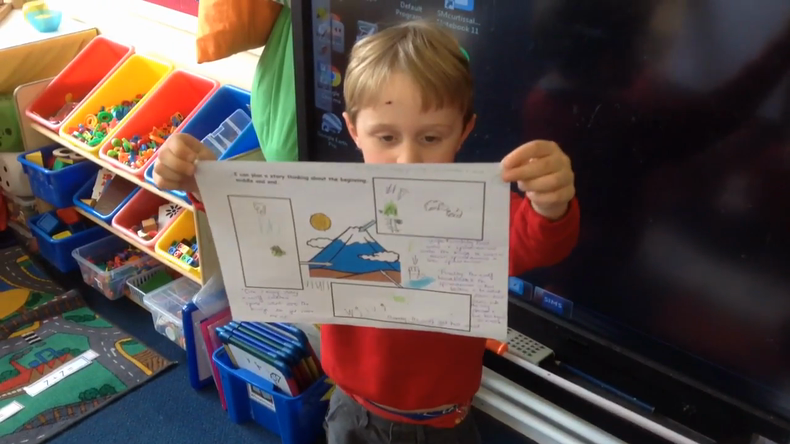 Despite the chilly weather we have been very keen to explore our new writing den resources. What an exciting day! We met Harry and Tiggy the hedgehogs and found out lots about what they eat, their predators and hibernation. We all got to hold and stroke them too. Which block of ice will melt the slowest: the one wrapped in newspaper, the one by the radiator, or the one outside? 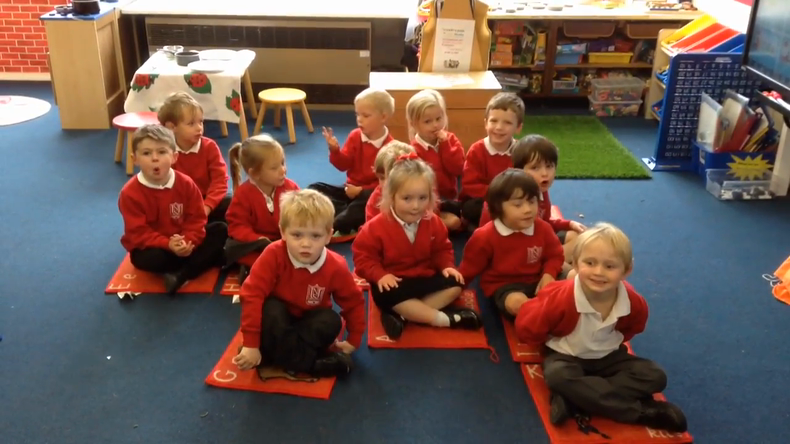 A very warm welcome to Acorn Class. Our topic for the Autumn Term is: 'Let's Make, Bake and Celebrate.' Please see our topic booklet and medium term plan below although planning is subject to change depending on the children and their interests. Please visit this page regularly to access letters and to see what we have been learning! A little bit of winter planting. Enormous thanks to Zander's mum for her help and expertise. Having fun in Santa's workshop. How lucky were we to be able to watch the performance of 'The Selfish Giant.' 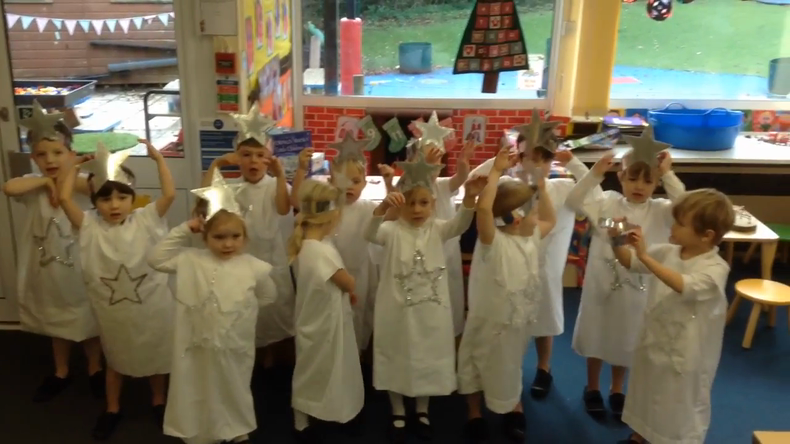 A super show enjoyed by all with lots of audience participation! How wonderful to welcome so many parents into class today for our clay workshop. We enjoyed retelling our story of The Gingerbread Man, made clay self portraits and shared Learning Journeys. We used 'We're going on a Bear Hunt' as a stimulus for our forest school afternoon with Treehouse to make our own bears using clay and forest materials. 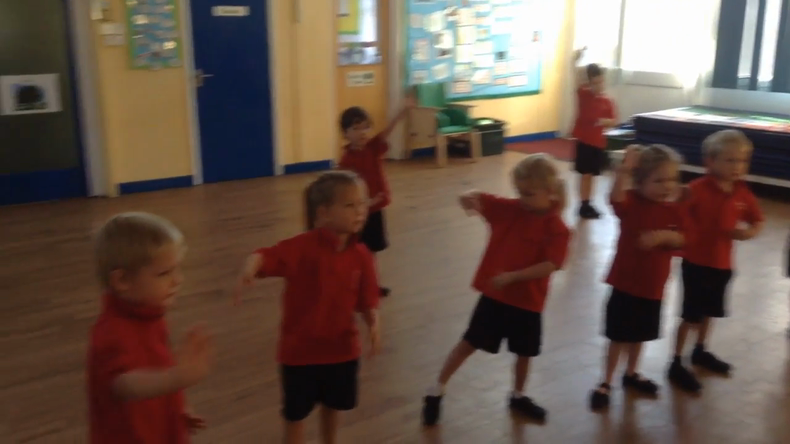 A little 'Bollywood' dancing to celebrate Diwali. We were a fabulous baking team today; lots of super listening and turn taking. We celebrated Diwali in lots of different ways today. Come into class to see our phenomenal self portraits on tiles. We have worked extremely hard and I'm sure you will agree, they really do look like us! Thanks to firefighter Lee who talked about dialling 999 and 'stop, drop and roll' today. We sang our hearts out today during the Harvest Festival and looked fabulous in our leafy hats. 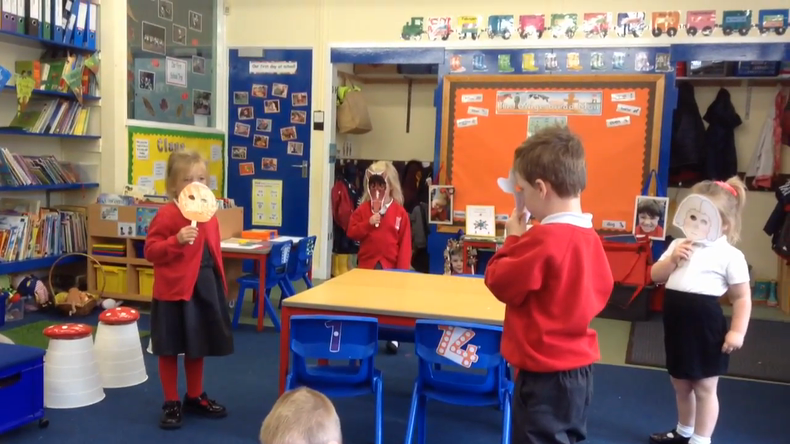 We acted out the Gingerbread Man and thought carefully about the voices we used for our characters. Today we made a friendship web and complimented each other. We talked about how happy this made us feel. Our first school trip! We built dens in the forest, collected signs of Autumn and enjoyed being together as we walked around Stourhead. 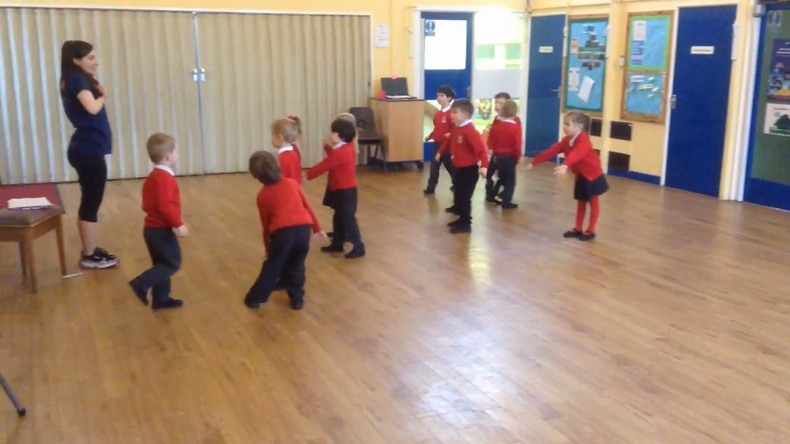 Amazing teamwork Acorn Class. We went to church and sang songs, shared our prayer pebbles and lit candles as part of our welcome service. It was lovely to see so many parents. Despite the poor weather, we made the absolute best of our BBQ by exploring the classrooms, sharing our learning with our families and eating hot dogs in the hall. Meeting and playing with our buddies was enormous fun. Building bird nests at forest school. We decided on our class rules together and made our Class Charter. During our visit to the Life Education bus, we met Harold the giraffe and talked about our bodies and how to keep healthy. What do you think of our self portraits? Can you work out who is who? Our first session of PE was a huge success and ended with time exploring the play trail. What an exciting first day!